Each week, those called by the gospel into God’s kingdom (1 Thess. 2:12; 2 Thess. 2:14) gather together to partake of communion (Acts 2:42; 1 Cor. 10:16-17; 11:23-28). We do this each Sunday because our Lord, while instituting his Supper, spoke of not partaking of it with his disciples again “until that day” when the kingdom of God comes (Matt. 26:29; Mark 14:25; Luke 22:18; cf. Matt. 18:20; Heb. 2:11-12). The kingdom – the church (Col. 1:13; 1 Thess. 2:12; Rev. 1:4, 6, 9) – came on the day of Pentecost, a Sunday (Acts 2:1-42; Lev. 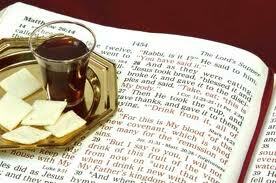 23:15-16), which is why the early Christians observed communion and gave of their means on that day (Acts 20:7; cf. 1 Cor. 10:16-17; 16:1-2). As with anything that is done with regularity, it can be very easy for “familiarity” to “breed contempt” with some, and more likely the thoughtless apathy of neglect with others. Each Sunday, thousands of Christians will break off a piece of unleavened bread and drink a small amount of fruit of the vine…just like last week. For some, there is not much time between their sip of the cup and the time when they know the offering plate will be passed around…and so now’s a great time to get that check ready. Everything’s usually very quiet during this time…what better time to get the kid’s snacks and coloring books ready before the sermon starts? Plus, that cute baby in the row right in front of you is grinning at you…surely it would be harmless fun for you to play “Peek-a-Boo” with her for a bit before the next prayer! Most or all of us – myself included – have been guilty of offering to God the meaningless worship which consists of doing what he requires of us in praise to him on the surface while our hearts and minds are thousands of miles away (Matt. 15:7-9). We need to remember that God requires and is looking for spiritual worship based in truth (John 4:23-24). Are we really any different from the one who habitually forsakes the assembly (Heb. 10:25) when we are present in body and action but absent in mind and spirit? For this reason, the abuse of the Lord’s Supper by the church of Corinth (1 Cor. 11:17-33) is a worthy topic for our consideration and study. Paul’s rhetorical question about them having houses to eat and drink in if they were hungry (vs. 22, 34) implies that they were looking at communion in the same way as they would an ordinary meal, something easy to start doing when partaking of it on a weekly basis. Thus, they were “digging in” without even waiting for all of their brethren to assemble (vs. 20-21, 33), leaving nothing…save humiliation…for those who came afterwards (v. 22). In this way there were despising God’s church for which his Son died (v. 22; cf. Acts 20:28) and were not worthy of Paul’s commendation (v. 22). There was another reason they were despising the church and worship of God, the same reason they had started treating communion like a common meal. They had forgotten the true purpose and meaning behind it. This is why God inspired Paul to remind them by talking first of the circumstances surrounding its institution by Christ, that it had begun on the night Christ was betrayed, the night before he died (v. 23). He then reminded them that the bread represents his body “which is for you” (v. 24), given to go through the horrendous pain and humiliation of scourging and crucifixion so that we would not have to pay the penalty for our sins (Rom. 5:6-11; 6:23; 1 John 2:1-2). The cup represents “the new covenant in my blood” (v. 25), the new covenant which does what the first could not: grant us forgiveness of our sins through the blood Christ freely shed on that cross (Heb. 8:7-12; 9:11-15; Eph. 1:7; cf. Acts 22:16; 1 John 1:7-9). We are to remember these things – all that Christ accomplished for us by his death – when we partake of communion (v. 25). By doing so, we “proclaim” the great significance of the Lord’s death until he comes again (v. 26). Of course, a failure to remember the eternal significance of the Lord’s sacrifice shows that one considers that sacrifice to be “a common thing” (Heb. 10:27), a mindset that leads to willful sin that makes that sacrifice of no benefit to you (Heb. 10:26-31). This is why God considers those who partake of communion “in an unworthy manner” – i.e., without remembering his death and the significance of it – to be guilty of basically crucifying his Son again (v. 27; cf. Heb. 6:4-6). This is why we are to examine ourselves when we partake (v. 28; cf. 2 Cor. 13:5), in order to discipline ourselves to put our focus where it needs to be (1 Cor. 9:25-27). Communion is the Lord’s supper, not ours (v. 20). Literally, it “belongs to the Lord.” When we forget that, we forget to discern the sacrifice of his body which that bread represents…and as a result we become spiritually weaker and sicker until God brings the judgment of the second death upon us (vs. 29-30; cf. Rom. 6:23; Rev. 21:8). We need to be reminded of this, because oftentimes we do not look at what we do the way God does (v. 31; cf. Is. 59:2). I hope that my comments on these Scriptures will give us the proper discipline and motivation we need in order to no longer neglect the Lord’s Supper so that we will not be among those whom God condemns in the end (v. 32).